Terri returns to Advantage Credit after a 3 ½ year hiatus to pursue her dreams of working in the pastry/baking industry. Prior to that, Terri had been with the company since 1996 as sales support, customer service and rescore express representative. Terri’s current position is Administrative Assistant. With her overall knowledge of every aspect of the company she is able to assist in any department. Her expertise and attention to detail are an invaluable asset to the company. 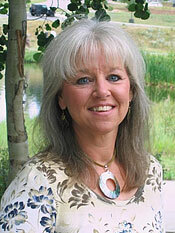 Terri is originally from the suburbs of Chicago but has resided in the foothills outside of Denver now for 17 years. And while she loves the mountains, her heart will always be back in Chicago with her family. In her free time Terri enjoys baking, taking walks and spending time with her son Dusty and her MinPin, Reggie. She loves watching the Chicago White Sox and Blackhawks and going back to Chicago to visit her family as often as possible.